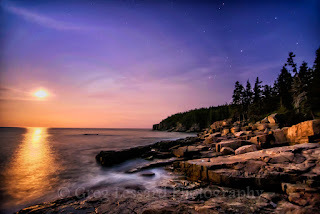 I am happy to announce that I will be leading a photo tour for the South Shore Science Center to Acadia National Park. The tour will be from October 16-18, 2015. We will visit many of the highlights of this fantastic island right at the peak of the foliage season. charm. Photographing Acadia is always a highlight of my year! I hope you will join me to see why. The price for the tour is $375, which includes all transportation, lodging and park entry fees. We will be joined by author and naturalist John Galluzzo, who will help us appreciate and understand our natural surroundings. To sign up please call the South Shore Science Center at 781-659-2559. The image accompanying this post was made at 10:30PM on July 3, 2015. The moon was nearly full and lit the landscape beautifully. It rose to the east and looked a lot like the rising sun in Acadia National Park. Fortunately, it wasn't so bright that it washed out all of the stars. Sitting in solitude on the rocks along the Ocean Path was an amazingly tranquil experience. A few cars and bicyclists passed by, but otherwise it was just the ocean waves and I that witnessed this stunning scene. Spending time alone along a beautiful shoreline is a fantastic way to find solace in nature.